“It was the happiest moment of my life, though I didn’t know it.” So begins the new novel, his first since winning the Nobel Prize, from the universally acclaimed author of Snow and My Name Is Red. It is 1975, a perfect spring in Istanbul. Kemal, scion of one of the city’s wealthiest families, is about to become engaged to Sibel, daughter of another prominent family, when he encounters Füsun, a beautiful shopgirl and a distant relation. Once the long-lost cousins violate the code of virginity, a rift begins to open between Kemal and the world of the Westernized Istanbul bourgeosie—a world, as he lovingly describes it, with opulent parties and clubs, society gossip, restaurant rituals, picnics, and mansions on the Bosphorus, infused with the melancholy of decay—until finally he breaks off his engagement to Sibel. But his resolve comes too late. For eight years Kemal will find excuses to visit another Istanbul, that of the impoverished backstreets where Füsun, her heart now hardened, lives with her parents, and where Kemal discovers the consolations of middle-class life at a dinner table in front of the television. His obsessive love will also take him to the demimonde of Istanbul film circles (where he promises to make Füsun a star), a scene of seedy bars, run-down cheap hotels, and small men with big dreams doomed to bitter failure. In his feckless pursuit, Kemal becomes a compulsive collector of objects that chronicle his lovelorn progress and his afflicted heart’s reactions: anger and impatience, remorse and humiliation, deluded hopes of recovery, and daydreams that transform Istanbul into a cityscape of signs and specters of his beloved, from whom now he can extract only meaningful glances and stolen kisses in cars, movie houses, and shadowy corners of parks. A last change to realize his dream will come to an awful end before Kemal discovers that all he finally can possess, certainly and eternally, is the museum he has created of his collection, this map of a society’s manners and mores, and of one man’s broken heart. A stirring exploration of the nature of romantic attachment and of the mysterious allure of collecting, The Museum of Innocence also plumbs the depths of an Istanbul half Western and half traditional—its emergent modernity, its vast cultural history. This is Orhan Pamuk’s greatest achievement. 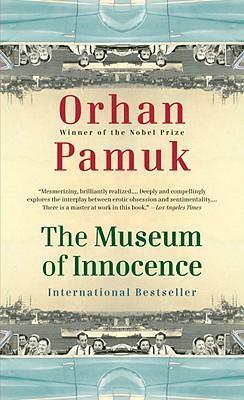 Orhan Pamuk won the Nobel Prize for Literature in 2006. His novel My Name Is Red won the 2003 IMPAC Dublin Literary Award. His work has been translated into more than fifty languages. He lives in Istanbul.